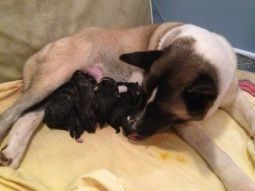 Akita breeders links and breed information on pups4sale.com.au. The Akita is a large, strong dog that is known for its good looks and its loyalty. This breed has long been known as the most popular dog in Japan, but became just as popular in other countries in the mid 1900s. While the Akita is one of the most beautiful dogs around today, they aren't necessarily the best breed for everyone. However, when trained properly, they can grow to be fantastic all-around pets. 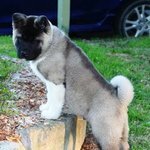 Thanks to Diamond Pearl Akitas for the photos used on this page. When standing straight up, the Akita looks like a proud and alert dog because, well, it is. When it moves you can quickly see why it is known as one of the strongest and most agile breeds in the world. The Akita's shorter hair makes some people think that it should be considered a medium-sized dog, but this breed is actually quite large. Males can grow to be about 28 inches tall and weigh nearly 120 pounds, while females top out at about 26 inches tall and can weigh around 110 pounds. A famous characteristic of the Akita is its long, curly tail. This is a characteristic that is found in all of the Spitz breeds, but it sticks out a bit more on the Akita because of the rest of its looks, including its bear-like head and shorter coat. The Akita's coat is thick and weatherproof, which helps it to stay warm in cooler climates. Its hair grows to be about two inches long and is soft on the outer layer and thick on the inner layer. The Akita is one of those breeds that you can find in just about any color. 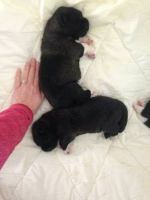 They can end up with either one solid color, or they can be a mix of colors, such as brindle. Akitas have an interesting mix of behavior characteristics. They can be very laid back and loving, while also being independent and full of courage. One of the things that has made the Akita so popular over the years is its calmness because this allows it to work well with big families with children around the house. Something else that makes Akitas attractive to potential owners is their ability to quickly learn how to be clean. It is in their nature to stay as clean as they possibly can, so house breaking them is a lot easier than it is with just about any other breed. 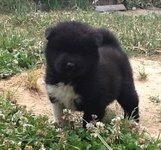 Akita puppies are as cute as can be, but they need to be taught early in their lives not to be aggressive with other dogs. They have an aggressive nature towards many other animals, so it's vital that they learn early on that they need to get along with everyone and everything. Akitas are some of the most gentle dogs around children, which is why they came to be known in Japan as a breed that could be left alone with very young kids. Of course, it is never a good idea to leave dogs alone with children, but it just shows how gentle and caring they are around the youngsters. Akitas don't necessarily have to grow up with other dogs or cats to be able to be good social animals, but they are tougher to socialize than other breeds. Akitas have gained a somewhat unfair reputation for being overly aggressive animals, but they can be pretty good social animals if owners take the time to put them through extensive social training. Akitas' loyalty to their owners and their courageousness make them excellent watch and guard dogs. They will bark at anything that they think is a threat to their owners or themselves and they will even attack if they think they have to. Dogs should never be left alone for extended periods, but Akitas are not as prone to separation anxiety as most other breeds. They do love to be around their families, but they also have no problem being by themselves and are happy to sit alone for with their favorite toys and bones. This is one of those breeds that simply has to be trained early on or it can lead to a lot of problems down the road. They are highly trainable, but many owners don't realize how far that training can go to help them become good family pets. This is why they need to be trained as soon as they are up for it and this training needs to continue pretty much throughout their lives. Many people are amazed at how quickly an Akita can learn a new command. Some of them can take only a week to be fully house trained, which is something that many owners look for in a breed. Of course, with things like socialization, it can take a bit longer to get through to them to overcome their nature of being a dominant animal. 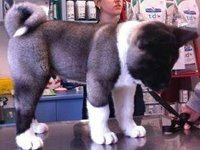 Owners don't absolutely have to have experience training this type of breed, but they have to know how to approach an Akita when training them. Their intelligence can be both a good and a bad thing for owners when training. They will try to outsmart them and training will prove to be a tough job if the owner don’t know how approach this breed. Once an Akita knows who is in charge, it is quite easy for them to learn many new tricks. In fact, they are known for moving through advanced training quicker than other breeds because they truly want to make their owners happy and show them that they are smart. Akitas are a unique breed in that they like to exercise on their own just as much as they enjoy going for a walk or playing with the family. This is why the best living situation for them is one where they have plenty of space both inside and outside of the house to move around. Unlike other large dog breeds, the Akita absolutely loves to go hiking and to go on runs with their owners. They were originally bred to pull sleds and to be work dogs, so they definitely have the energy to be outdoors for extended periods. Because Akitas love to use their energy, owners have to plan on giving them an hour or two outside every single day. They can become frustrated if they don't get their regular exercise, but they are as happy as dogs come when this need is fulfilled. Akitas don't have to have their hair cut, but it is very important that they are brushed very often or else they will shed all over the house. Owners should use a strong bristle brush on their Akitas every day, which will keep that beautiful coat in great shape all year round. Akitas have that naturally waterproof and clean coat, so this is one of those breeds that does not have to be bathed very often at all. In fact, it is best not to bath them too often to keep their hair as healthy as possible. Akitas a pretty healthy animals, but they are prone to hip dysplasia and immune diseases later on in life. Hip and other bone issues can be avoided, though, if owners make sure that they don't work their dogs too hard once they get a bit older. For the most part, Akitas live between 10 and 12 years, but like with other breeds, they can live a bit longer or a bit shorter depending on their overall health. People who have experience training a naturally dominant dog will be a very good fit for an Akita. These people tend to get the most out of this breed, so while it isn't totally necessary, people who know how to approach this style of training do seem to get the most out of their Akitas. For people who don't have experience with this type of breed, patience and the ability to show the dog who is boss in a calm and assertive way will be great fits. When it comes to Akitas, the bigger the family the better, so people who want a great family pet will find that this is a great breed for them. As long as they get the training that they need, Akitas are usually seen as the perfect family dog. While it isn't absolutely necessary that Akitas have a big house to live in, they should have a decent sized yard so they can stretch out and run around when they need to. This is why Akitas are not recommended for people who live in small apartments with either a small backyard or no backyard at all. Akitas are also not a good fit for people who aren't active or do not have the time to give this breed the exercise that it needs. They can cause a lot of damage around the house if they become frustrated, so people who simply don't have the time to help an Akita release that energy in a good way just won't be a good match.